Dave The Mortgage Broker > Monday Morning Interest Rate Updates > Are Canadian Bond Yields About to Push Our Fixed Mortgage Rates Higher? It stood at 1.82% on February 28 before plummeting to 1.40% on March 27. Lenders were initially slow to lower their five-year fixed rates, but they eventually dropped them from a range of 3.29% to 3.54% in late February to a range of 2.94% to 3.14% by late March. 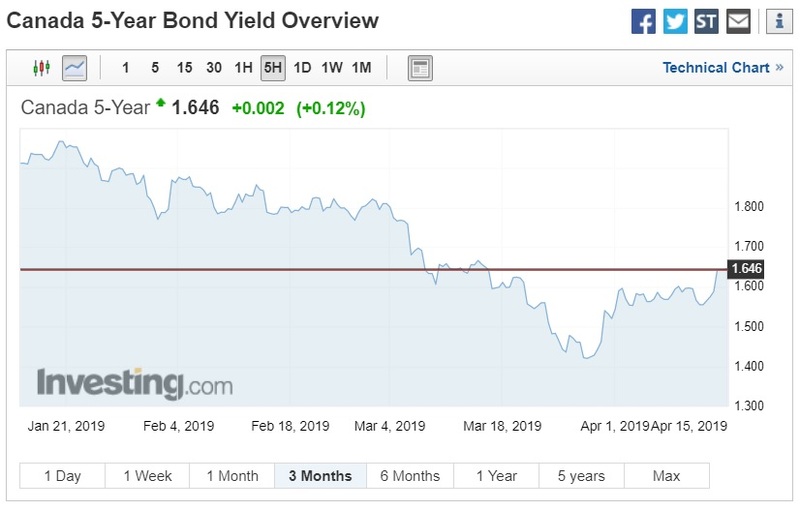 Since that time, the five-year GoC bond yield has ricocheted back up, and by last Friday it closed all the way back at 1.64%. If the chart on the right were a roller coaster ride, it would come with a motion sickness warning. Thus far, five-year fixed rates have held steady but probably only because we are entering the spring market, when rate competition ramps up and lenders are willing to live with tighter margins. The recent lurching in GoC bond yields may be an indication that we are at a turning point in the economic cycle. For its part, the Bank of Canada (BoC) is holding fast to its belief that our current soft patch will prove temporary and that our economy will resume its upward trajectory in the second half of the year. Bond market investors, at least until recently, have been betting that we are facing a longer downturn, and I remain steadfast in that belief. Our GDP growth rate slowed to only 0.4% on an annualized basis in the fourth quarter of 2018. That result seemed to confirm that our economic momentum was slowing sharply, but then our GDP grew by 0.3% in January (or by 3.6% on an annualized basis). And that occurred despite the introduction of Alberta’s oil-production quota, which caused the oil and gas sector to contract by 3.1% during that month. Canadian employment growth started 2019 on a tear. Our economy added 67,000 in January and 56,000 new jobs in February, before losing 7,000 jobs in March. Those results surprised market watchers because our earlier GDP data did not portend robust employment creation, and our recent average wage growth of 2% remains well below the 3.5% to 4% range that historical models indicate we should see when our unemployment rate hovers at 5.8%. The Loonie has proved surprisingly resilient throughout this recent slowdown. It would normally be expected to weaken against the Greenback, giving a boost to our exporters and providing a natural shock absorber for our economy. But it peaked at $0.76 USD last July, bottomed out at $0.73 USD in late December, and closed at $0.75 USD last Friday. That is quite a tight trading range for a period of heightened uncertainty and at those elevated levels, the Loonie is acting as a headwind against our economic momentum. Trade uncertainty continues to cloud everyone’s economic outlook. The ongoing U.S./China trade war has been long on hope but short on demonstrated progress. Brexit negotiations have gone nowhere, and the only consensus seems to be that the can should continue to get kicked farther down the road. Our federal government is threatening not to sign the new USMCA if the U.S. doesn’t remove its new tariffs on Canadian aluminum and steel; U.S. House Democrats are threatening to reopen the USMCA; and U.S. President Donald Trump has threatened to pull the U.S. out of NAFTA if that happens. Against that backdrop, the BoC expects that consumer spending will slow in response to the combined impact of recent policy-rate increases and mortgage rule changes. The Bank hopes that rising export demand and increased business investment will take the reins and serve as the main drivers of our economic momentum going forward. Until lately, the bond market wasn’t buying it, but the recent uptick in bond yields implies, to my surprise, that may no longer be the case. 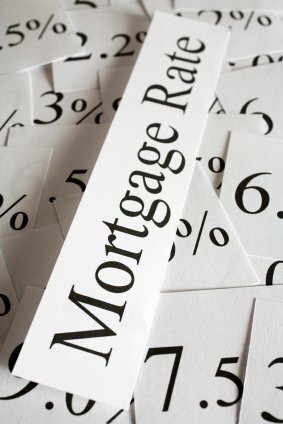 The Bottom Line: The BoC has said that it will take time for our current economic picture to become clearer, and if you’re a variable-rate mortgage holder, that means that your rate isn’t likely to change for some time yet. But longer-term bond yields are more sensitive to changes in our economic outlook and as such, are subject to wider swings at turning points in the economic cycle. We’re seeing evidence of that now, which is why – as strange as it is for me to type this – we may actually see bond yields push our fixed mortgage rates higher, at least temporarily, over the near term.